On the nose, musky honeyish tones of pineapple and ripe tropical fruit plies hints of earthiness. Fairly sweet, thick-textured middle on the palate. Spicy finish. Oh I have had this beer before. 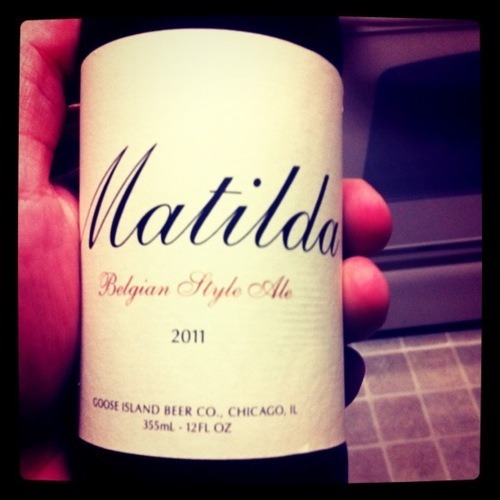 I can’t remember where I first had this beer, but it is one of my favorites from Goose Island. I am still sad that Anheuser-Busch bought them. Regardless, this beer is one of my favorites from them. I have had this both in bottle and on draft. I like ordering this on draft when I am at their Wrigley location. It’s also got a pretty big ABV, and one that is not very noticeable when drinking this beer. The beer smells incredible! Holy cow, it smells of fruit and… and happiness! Then you taste it, and are just blown away with not only how smooth this sucker is, but the somewhat thick, soothing mouthfeel you experience. It slides down the back of your throat, and sticks around for a few minutes as you enjoy that bittersweet aftertaste. By the time the aftertaste fades, you are ready for another drink! This beer is readily available. You can get it at pretty much any liquor store (sold in 4-packs if I do recall correctly) or by the bottle at places like Whole Foods and Trader Joe’s. I highly recommend this beer to anyone who likes… who likes a good tasting beer. It doesn’t taste like beer, and truly does get better with age. You can cellar this beer for up to two years and still get all those same notes that you pick up right off the shelf. Big fan of Goose Island and a HUGE fan of this beer. I have had this beer before, but I honestly don’t really remember what it tastes like. I know that Ricky loves it, and it is a Goose Island beer. They are usually pretty darn good. We have actually been to the Goose Island brewery in Chicago. I’m a little worried about what will happen to them now that they have been purchased by Anheuser-Busch, but I suppose we will just have to wait and see on that one. The Matilda pours out into a glass as a nice thick, golden color, similar to Blue Moon, but maybe a shade darker. It has only a very slight head, and the smell… well, I can’t really smell it much. It smells wet, but I can’t really place what else I smell in it, exactly. Let’s taste it – I know that will be good. Yum. This is a good beer. I’m not sure what kind of beer it is classified as, but it has a lot of different elements to it. It has a rich flavor, which is what I enjoy in the barleywines I like so much. It’s not as rich as a barleywine, but I still like the taste very much. And it has a light hop to it, almost… just barely, but it is there. And also, a hint of spiciness. This is one complex beer. It tastes great out of a bottle, and I know from experience that it is even better on tap. Definitely one I will be buying again and again.